They found that different proteins of this class bind to different DNA locations, and particular amino acids in each protein determine those locations, called binding sites, in a very straightforward way. "When we hit on it, we thought, 'Wow, this is so simple, it's ridiculous,'" Bogdanove said. Bogdanove's research will be published in an upcoming issue of the journal Science and is highlighted in last week's Science Express, an early online edition for research the Science editors feel is particularly timely and important. The paper is being published alongside a study from another research team that arrived at the same conclusions independently. In his research, Bogdanove was examining how Xanthomonas uses TAL effectors to manipulate gene function in plants in ways that benefit the pathogen. Bogdanove was specifically interested in how different TAL effector proteins are able to activate different corresponding plant genes. Over the past decade, understanding of this unique class of proteins has grown in leaps and bounds, according to Bogdanove. Researchers in Germany, at Kansas State University, Manhattan; and here at Iowa State (Bing Yang, assistant professor in genetics development and cell biology) had previously shown that these proteins bind host DNA and activate genes important for disease, or in some cases defense against the bacteria. But no one yet understood how different TAL effectors recognized different parts of the DNA in order to attach and turn on the different genes at those locations. 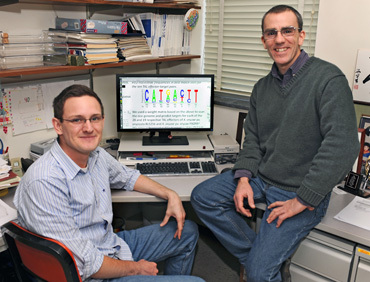 Through computer analyses, Bogdanove and Moscou discovered that pairs of amino acids distributed throughout a TAL effector protein each specify a particular nucleotide, one of the bases in DNA abbreviated as the letters G, A, T, or C. The complete set of these pairs directs the protein to a matching string of Gs, As, Ts, and Cs in the DNA. "This simple relationship allows us to predict where a TAL effector will bind, and what genes it will activate. It also makes it likely that we can custom engineer TAL effectors to bind to virtually any DNA sequence," says Bogdanove. According to Bogdanove, being able to predict TAL effector binding sites will lead quickly to the identification of plant genes that are important in disease. Natural variants that lack these binding sites are a potential source of disease resistance. Another potential application is adding TAL effector binding sites to defense-related genes so they are activated upon infection. The possibilities for this new technology extend beyond plant disease control, according to Bogdanove. "We might be able to use TAL effectors to activate genes in non-plant cells, possibly even in human stem cells for gene therapy. Or we might be able to use them to modify DNA at specific locations and help us study gene function. This could apply in many areas, including cancer research, for example," he said. Bogdanove said the simplicity of the results surprised the research team. "A predictable and potentially customizable kind of protein-DNA binding has been hard to find in nature. As Matt and I talked about the possibilities, we got excited and one of us said - I don't remember who - 'We've got to submit this to Science, dude,'" said Bogdanove. Moscou investigated TAL effector DNA binding with Bogdanove through his participation in the Bioinformatics and Computation Biology (BCB) Lab, a student-run organization that provides assistance with computational analyses for life science researchers on campus. Moscou is a founding member of the BCB Lab, which is supported by a training grant to the BCB graduate program from the National Science Foundation. Moscou is doing his dissertation research on a plant pathogenic fungus under Roger Wise, professor in plant pathology. Research in the Bogdanove laboratory is supported by funding from the NSF Plant Genome Research Program and from the United Stated Department of Agriculture - Agricultural and Food Research Initiative program.